I realized the other day that I never write about gardening on this blog, even though it’s a big part of my life and one of the main reasons I bought my own house and yard. Throughout my apartment-dwelling life I’ve had many container gardens. One particularly nice one was in Halifax, Nova Scotia during my university days. It was on a modestly sized sunny balcony on the second floor of a huge heritage house. 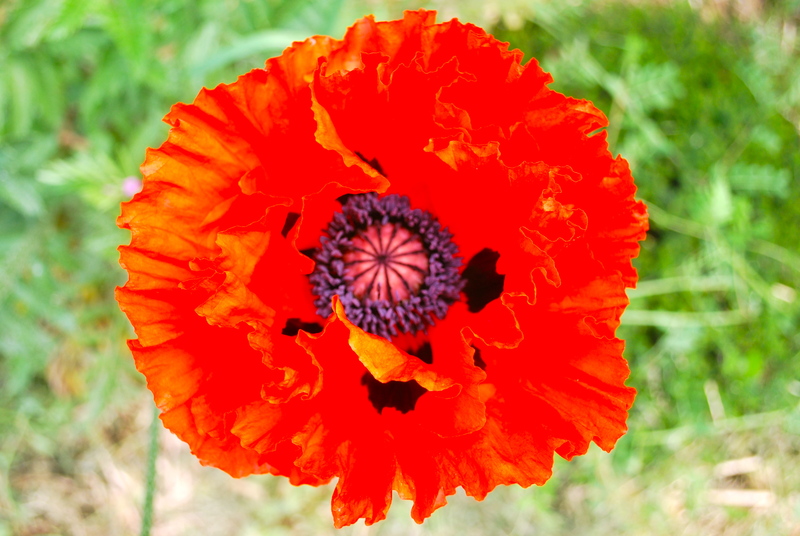 That was probably the garden I was most proud of… It was packed with poppies, nasturtiums, delphiniums, a giant dill plant, violas, sweet alyssum and wildflowers. I used to sit out there in the sunshine with my cats with butterflies and bees flying around everywhere and feel like a pretty damn good gardener. 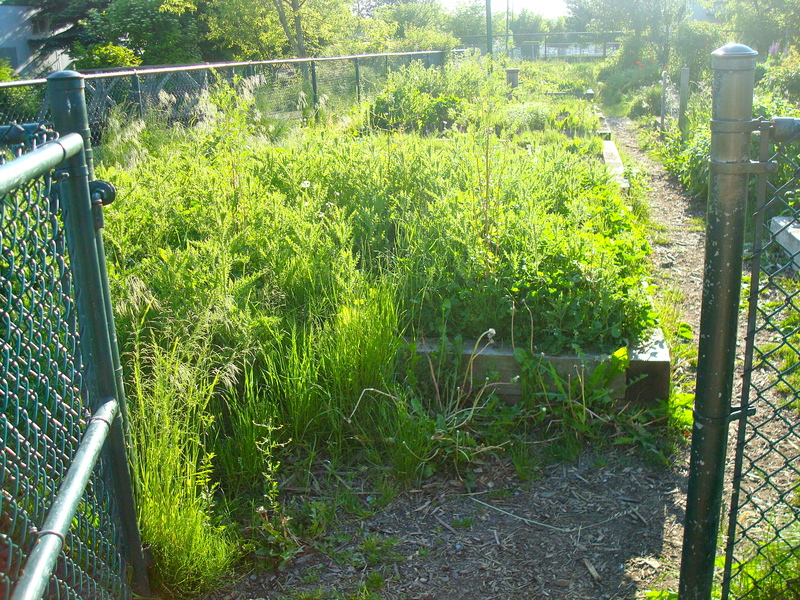 Luckily around the end of my stay there I was able to glean myself a community garden plot at the elementary school down the street. 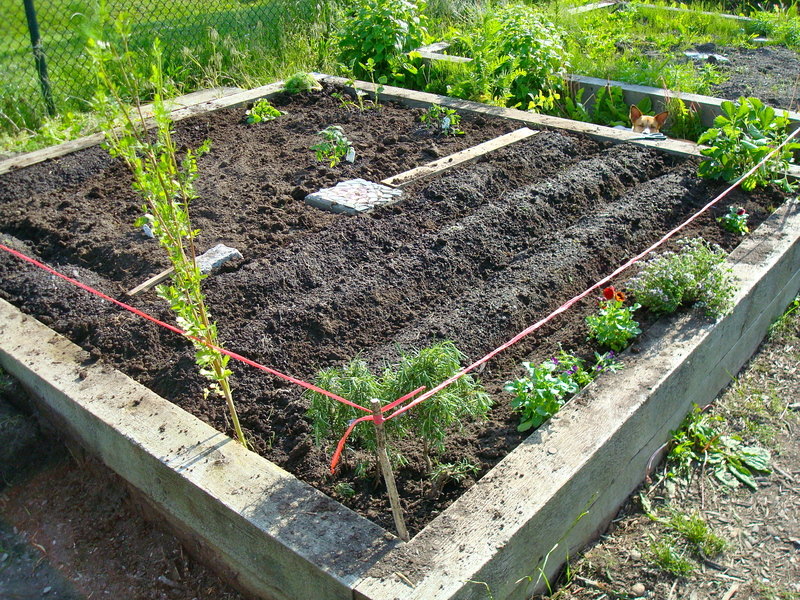 I had what seemed to me like a huge, 10 by 10 foot raised bed, stuffed to the brim with amazing rotted manure and compost. And weeds. It was a beautiful sight! Without doing hardly anything other than the initial weeding, including not staking my indeterminate tomatoes, my vegetables were producing madly. I think other community members were probably watering my plot sometimes which I’m sure helped and was very nice of them. Sadly, in the part of town I was living in, you were lucky if you were able to harvest anything out of your community plot before someone else did. It was always a gamble between letting something ripen for one more day, and it being gone. I had to improvise by planting unusual varieties like Aunt Ruby’s German Green Tomato, which fooled thieves into thinking the tomatoes were still unripe. It turned out to be one of the best things I’ve ever done, because they are now one of my favorites, (much more flavorful than any reds I know), and I grow them every year. I also employed psychological warfare which worked pretty well, despite many strange questions from fellow gardeners. One time, my entire beautiful huge row of beets were taken all in one night. Another time, my whole big, bushy chive plant was razed to the ground, along with everyone else’s. Then there was the time I actually caught red-handed the person who had been doing most of the pilfering: an elderly chinese woman who I had been helping to carry water and move compost to her plot for months. It was a crushing experience. After that, I just didn’t have the heart to grow anything there anymore. But now I have my own garden in my own yard with a great big fence around it and two guard dogs. Someone taking something out of my yard without my consent is not going to happen. After hours of backbreaking work removing sod and tilling over what looked like amazing soil, I had a garden that year. But it was a pitiful one. Despite the addition of some rabbit manure; with the protective surface layer of grass gone, my amazing-looking soil baked in the sun, became hydrophobic and a total weed magnet. I got something of a harvest that year, but the rabbits and chickens were thrown far more weeds than I ever had of tomatoes or peppers. Now I’ve made some important changes around here. I think I’m finally getting the hang of things. In many ways, the traditional rules of gardening were always somewhat counter-intuitive to me, and I’ve discovered that when I simply follow the guidelines that I observe working in nature, I end up with much better results. I’ve learned a lot over the years and I’m ready to do things right. I don’t want to be constantly weeding and watering, I don’t want to use chemicals, and I don’t want to shell out money for things like manure or mulch. Check back soon for part two of this post, where I talk about what I’m doing with my gardens now. Thanks for reading! This entry was posted in gardening and tagged community garden theft, learning about gardening, my first garden sucked, raised gardening beds, stop thieves from stealing tomatoes. Bookmark the permalink. 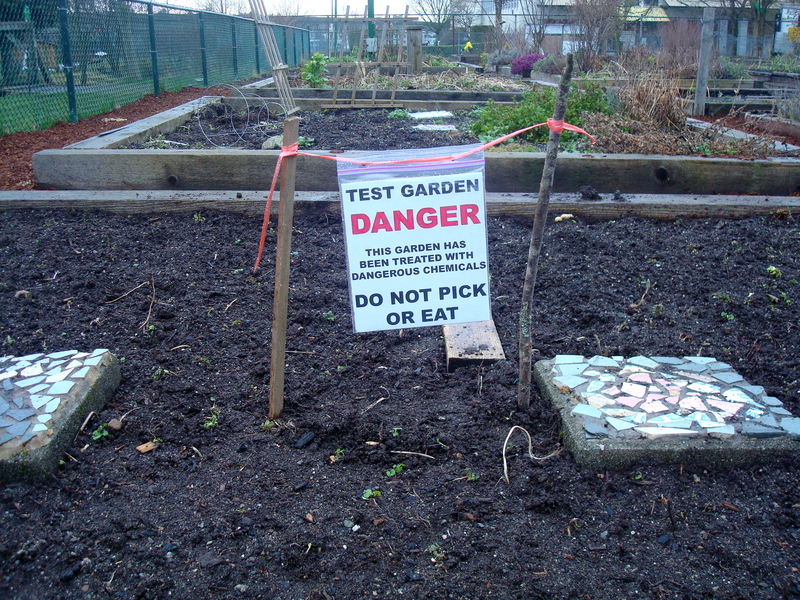 I’ve been trying to explain “human pests” as an urban gardening problem (along with insect and animal) to others that have never tried gardening in the city. Glad you have a space of your own! That’s very interesting, I never thought about it that way before. Thank you! The dangerous chemicals sign is hilarious! Thank you, looking at it now I feel I could have made it so much more effective!